The Unicaf University Malawi Campus is an institution created to benefit the people of Malawi, which remains very close to local society. It maintains an open doors policy and is ready to host any school, organised group or individual who wish to visit the campus and learn about the programmes and services it provides to its students. Mantove Academy is a private secondary school for girls from central Malawi, Salima district. It is one of the most technologically advanced secondary schools in the country. After requesting a tour of the campus, 28 pupils of the Academy between the ages of 12 and 17 visited the Unicaf University Malawi Campus, accompanied by two their teachers, Ms Mtisungeni Joseph and Mr Nickson Phiri. The purpose of the visit was to allow the Academy’s students to view the facilities of the UUMA campus and to learn about the range of study programmes available. 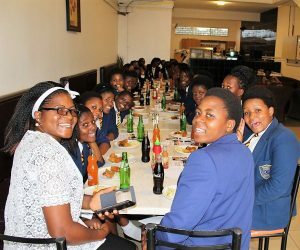 A familiar face welcomed the pupils, Duncan Batizani, Senior Academic Affairs Officer for UUMA, who had previously taught the girls at the Mantove Academy. The girls were shown to the campus amphitheatre and the Vice Rector of UUMA Buxton Mpando gave them a short history of UNICAF and its role in helping talented and ambitious youngsters earn internationally recognised degrees. 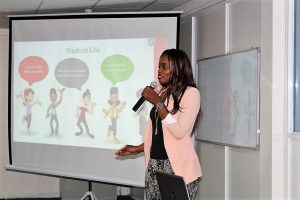 Andrea Chimwemwe, UUMA Marketing Officer, continued with a brief power point presentation, focusing on the approval of all UUMA study programmes by the National Council for Higher Education of Malawi and outlining the novel modes of study available at UUMA. Andrea explained to the pupils that online learning simply requires the use of any electronic device that is connected to the internet, (for example, a laptop, smart phone or tablet), and the student is able to access study material, complete assignments, take exams, receive results and interact with tutors, instructors and fellow students. Referring to the blended learning mode of study, Andrea explained it is a combination of online study with traditional classroom tuition. She presented the range of degrees at Bachelor and Master’s level offered by UUMA, and underlined to pupils the benefit of the generous UNICAF Scholarship Programme, which may cover – in certain cases – up to 80% of tuition fees for eligible students. Andrea also explained that UUMA offers a vibrant campus life to its students, with a variety of social and networking events organised regularly, and ended her presentation by showing the girls the free Windows 10 Tablet, received by every registered student after paying the required deposit. 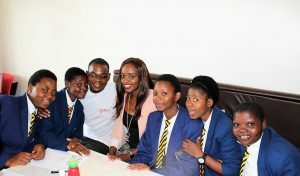 The girls were impressed and asked questions, mainly about the requirements for entry to the bachelor programmes. Ms Mtisungeni Joseph, one of the teachers accompanying the pupils thanked the University staff for their warm reception and stated: “Not only does Unicaf University provide a hospitality management programme, it also practices hospitality…. I am actually now planning on doing my Master’s here at Unicaf University”. The pupils were taken on a tour of the UUMA campus, taking in the seminar rooms, the computer lab, the conference room and finally the campus cafeteria, where they were offered snacks and drinks and had the chance to interact with UUMA staff and Unicaf University’s International Operations Manager Loucas Epiphaniou. As a souvenir of their visit, the girls were given Unicaf University t-shirts, which they wore with excitement and pride.